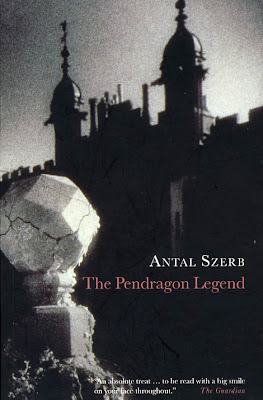 The admirable Pushkin Press have been shining their spotlight on the Hungarian novelist Antal Szerb recently. Perhaps best known for his novel Journey By Moonlight, Szerb was one of the many victims of German anti-semitism, refusing to leave his native country despite many opportunities and as a result deported to and later beaten to death in a labour camp in 1945. He left behind three novels, the first of which was inspired by the year he spent on a post-doctoral scholarship in England. Happily ensconced within the Reading Room of the British Library, preparing what would become his landmark reference works, the Histories of English Literature and World Literature, he was also able to indulge his interest in Rosicrucianism and the Occult. Combining these with his intelligence and awareness of the popular fiction genres of the time he produced this, his first novel, one of the more downright enjoyable reads I have had recently; a guilty pleasure you needn't feel guilty about, filled as it is with an outsider's insight into British culture and a scholar's erudition about moral and religious quandaries. At a soiree near the end of the season Janos Bátky, 'Doctor of Philosophy, specialising in useless information, with a particular interest in things a normal person would never consider important', is introduced to the Earl of Gwynedd, just the kind of person who might consider them important. We are well used to our gentry being on the eccentric side but stories swirl around the Earl and his family seat of Pendragon Castle that are enough to raise the hairs on your neck, or at least a chuckle from a friend of Bátky's. An invitation comes for Bátky to join the Earl back home in Wales, an invitation he is keen to take up; after all 'He seemed to embody an historical past the way no book ever could.' But before he can head off he receives a mysterious phone call. "Hello, is that Jonos Batky?" a man's voice asked. "I'm talking on the phone. Who are you?" "Never mind. Are you in an enclosed booth?" "Janos Batky...you would be well advised not to get involved in other people's affairs. You can be quite sure that the people you are working against are aware of your movements." "I'm sorry, there must be some mistake. I've never worked against anyone. This is Janos Batky speaking." "I know. Just bear this in mind: everyone who pokes their nose into the Earl of Gwynedd's little experiments comes to a sticky end. Dr McGregor died in a road accident. The same thing could happen to Dr Batky." He ignores the warning of course and is soon heading towards Wales accompanied by Maloney, a man from Connemara who befriended Bátky whilst working in the aforementioned Reading Room, and who just happens to be heading to the Earl's estate himself. There is no need to get too involved with the plot here, that would take away some of the fun, but a large family inheritance, ghostly apparitions, murder attempts and cunning disguises all have a part to play and with the Pendragon motto being "I believe in the ressurection of the body", those rumours about the Earl might just be worth investigating. It is a riot of competing genres which combine to create something that might have been written by the lovechild of Christie, Fleming, Doyle, Brown (Dan), Wilde, and Poe (I mean that in a positive sense). Written with love for the genres he is satirising and a clear relish for his subject matter, the book has an infectious energy which, when combined with a strong sense of humour, help the pages to fly by at quite a lick. You often read of books described as a romp - this book is a romp in the most delightful, positive sense of the word. Bátky, as a central character, has an intelligence matched equally by his inexperience, helpfully leading him into scrapes and pickles from which he eventually extricates himself. Particularly amusing are his amorous advances, for in the same way that he is fascinated by the Earl for what he represents, his daughter holds her own fascination as the lady of the castle with Bátky as her errant knight. Szerb's finely tuned observations of Britishness and Len Rix's excellent translation make for an effortless read with delight after delight that belie the book's age (first published in 1934). The Earl's private library of ancient texts and codices will have even the slightest bibliophile salivating, the fast-paced plot should satisfy those in need of a thrill (Szerb even manages to pull off a genuinely chilling and stylistically adventurous ending) and the colourful cast of characters are brilliantly rendered through the eyes of our companion Bátky. I'll leave you with his attempt to describe his long time friend. "...Lene Kretzsch is a robust, fine-looking creature. Her figure is quite perfect, in the classical sense..."
"Do you mean she has large feet and hands, like a Greek statue?" "That is to say, of easy virtue?" "Not exactly. She is sachlich. Neue Sachlichkeit. Bauhaus. Nacktkultur. The chauffeur type. Love is a psycho-physical fact. Nothing romantic or complicated about love." "And this is what you call 'modern'?" "Well, according to the international conventions drawn up by journalists and women-novelists, this objectivity is what characterises modern love." I own a copy of this, more accurately we do as actually my wife bought it. She's a bit of a Szerb fan. Somehow it hadn't yet grabbed me, but reading your review it's nothing like I imagined it, in fact it sounds brilliant. Fun, clever, fast moving. This will definitely be moving up my TBR pile. Thanks. I was surprised by it too Max, I think its a book that many disregard because of its rompish qualities and the high regard for his novel Journey By Moonlight. That book is on my TBR pile and I look forward to it after finding so much to enjoy in this one. I hope you like it too. Emma loved Journey by Moonlight, it's what led her to the others. Apparently it is excellent. "I'm talking on the phone. I just finished this last night William. Wonderful. Thanks for encouraging/inspiring me to read it. I'm so pleased you liked it Max. It's great, isn't it.